With the events of January 25th, a shot rang out across Europe, which would reverberate across the world. The election of the first radical left government in decades, which threatened to challenge the rule of austerity in the European Union. Maybe it was the sound of Bella Ciao, the song of Italian partisans, playing at the victory rallies. Or perhaps it was the sheer elation of the mass of people who believed that they had delivered the first blow against neoliberalism in the fight for Europe. In any case, the international left could not but help getting caught up in the mood of victory, the mood of triumph. Once again, the forces of the Marxist left in Greece had begun to wage war, and we were to have the honour of aiding them in their battle through whichever means possible. Holding out under international pressure from austerity hawks in the Troika for the first few weeks, it appeared SYRIZA’s leadership was ready to take the fight to the enemy. Our aspirations were all rebuffed with the concessions SYRIZA made on February 20th, effectively agreeing to abandon its electoral programme. The Troika was no more, in its place the same framework would exist under “The Institutions”, which would now issue the same diktats to the Greek government. The extension of the bailout was an arguably necessary move for SYRIZA to prepare for the final confrontation and rupture with the systems of austerity. After all, you can’t prepare for something as serious as Grexit in less than 4 weeks, it requires months to make the necessary preparations, to gear the state and the people towards the dramatic economic reality they would soon be facing. So in the face of a tactical retreat to regroup forces, one could see the concessions SYRIZA and its negotiating teams made as a necessary move. And so we, the outside observers largely powerless to affect the situation, waited. We waited for the grand strategy to materialise, the strategy for confrontation. The strategy, which we now realise – thanks to the relentless whistleblowing of former Finance Minister, Yanis Varoufakis – was never to be formulated to start with. Following the defeat of late February, those of us who already hadn’t would begin to realise precisely the beast SYRIZA was up against in the Troika. The European Union, an alliance of capital, was either going to contain the political contagion of a left government rising in Europe, or the economic contagion of a Greek exit from the Eurozone. To answer the ideological attack on neoliberalism that SYRIZA represented would require substantial economic risk, and we saw on the 6th of February that the Troika was willing to take that risk when it announced Greek bonds could no longer be leveraged as collateral, commencing the economic war on Greece which would continue and escalate over the coming months. This, however, did not deter the SYRIZA leadership which insisted that a deal was still possible. And in the realm of economic rationality, that made perfect sense. A deal was the only way for the economic interests of European capital to be protected while still allowing both sides to save face politically. Simply put, the debt could not be repaid no matter what stance you took, and a refusal to deal meant a default on that debt, the results of which would be something that we still can’t predict, except for the fact it would threaten the stability of the Eurozone, and consequently the European Project itself. When negotiations fundamentally broke down and the Greek negotiating team was made an offer it could not refuse but also could not accept, Tsipras played his ace in the hole and called a referendum on the deal offered. Hearkening back to the legend of “Oxi” – the word which became the symbol of anti-Fascist resistance in Greece at the start of its involvement in World War II – the radicalised working class of Greece under the apparently reluctant leadership of SYRIZA campaigned successfully to reject the deal. And this was no small victory. In the face of financial terror, with a a refusal to extend the bailout and the ECB capping Emergency Lending Assistance thus threatening the banks with collapse, and in the face of a mass media propaganda campaign, firstly from local media oligarchs in Greece, and secondly from the so-called European partners, Greece returned a resounding rejection of the deal and of austerity, with 61% voting No. And it was this superb victory, this historic event the likes of which had not occurred for decades, which made the actions of the SYRIZA government so shocking. The results had not even come in before Tsipras had asked for a new bailout from the Troika and had gone back to the negotiating table, proposing deals almost identical to the one the workers of Greece would and had rejected. In less than 24 hours, the resounding Oxi would turn into a meek Yes. Smelling blood, the Troika institutions – primarily the Eurogroup lead by Germany’s Wolfgang Schäuble and backed by the unsurprisingly hostile Irish and Spanish governments – refused to strike any deal better than the one rejected in the referendum. Facing Grexit, Tsipras was left a single choice, and that was to capitulate to the Troika’s demands. The deal was to, in effect, turn Greece into a colonised state under control of European capital, through the Commission. Automatic budgetary adjustments in the case of a violation of Eurozone fiscal rules, transfer of tens of billions of Greek state assets to independent funds for privatisations, attacks on social securities, and tax hikes – an effective economic coup, so blatant that it trended across the entire globe on Twitter. If anybody would have held illusions in the nature of the European Union prior to this, let those illusions be shattered. Anyone who’s kept up with Greece knows what happened. However, too many of us are left asking ourselves why it happened – how could it come to this crushing defeat? Did Tsipras not know the result of Troikanomics? How could he not? The scars of it are written across Europe. Surely SYRIZA’s economists, left, right and centre, know the damage austerity has done to Greece. Surely they knew that more austerity means more economic contraction, which in turn means greater inability to repay the debt? Of course they know! So does the Troika! It’s not an accident that the IMF, the most serious of neoliberal hawks on the planet, has backtracked on its demands for unflinching austerity and has called for a 30 year debt payment moratorium, and a serious debt restructuring. We must ask ourselves – was this an inevitable series of events? Allow me to posit: Yes. It was not inevitable in that SYRIZA couldn’t do anything. I simply state that they wouldn’t have done anything and they had never intended to do anything to avert this defeat. What has happened here is the inevitable result of the failed ideological orientation of Alexis Tsipras and the clique running SYRIZA and – unfortunately – Greece. And this shouldn’t surprise any of us, after all, wasn’t the self-stated mission of Varoufakis to “Save European capitalism from itself”? SYRIZA would never have taken the necessary steps to break with austerity. This reality emanated from every fibre of its existence, from every policy it proposed to every piece of rhetoric it produced, never was a path of confrontation proposed, and it required a special form of wilful ignorance on the part of the left to not recognise the reality for what it was: SYRIZA was and continues to be a party acting in the interests of capital, orientating towards a slightly less brutal capitalism within the confines of the neoliberal hegemony of the bosses’ European Union. When, after months of negotiation, SYRIZA did not begin preparations for Grexit, we should have seen this. When SYRIZA’s campaign for Oxi was based on “Vote No and we’ll go back to the negotiating table”, we should have seen this. The story of the working class in Greece can be summarised as follows: Lions led by lambs. Heroes led by cowards. There are mumblings of a great “betrayal” on the part of SYRIZA, when in reality this is precisely what they said they would do all along. Negotiate for a better deal. Save European capitalism. It seems that we on the left were lulled into the possibility of there ever being a rupture by listening to the musings of comrades in SYRIZA’s Left Platform, such as Costas Lapavitsas and Stathis Kouvelakis. Regardless of their positions on the way forward, the reality is that they are, along with the rest of SYRIZA’s revolutionary left, in bed with an organisation which cannot serve as a vehicle of the working class, and in doing so have provided a substantial left cover for the actions of Tsipras and his clique. I never believed we should go straight to a new currency. My view was – and I put this to the government – that if they dared shut our banks down, which I considered to be an aggressive move of incredible potency, we should respond aggressively but without crossing the point of no return. Even when faced with the mandate from the youth and workers of Greece to resist, the leadership of SYRIZA still insisted on concessions. After a stunning victory, the leadership behaved as in defeat, attending a meeting of the right wing, corrupt, Capitalist parties which have dominated Greek politics all of these years and brought the country to its knees. For those who still held illusions in Tsipras, this class collaborationism in its more bare form should have shocked us. From the outset SYRIZA was going to lose, and it’s because it was a reformist project, believing that the slave can negotiate their way to equal position to that of the master. Believing that they could negotiate with the Troika, SYRIZA handed to the enemy the keys to its own defeat. As a delaying tactic, of course negotiation was necessary. But only up until the point the necessary forces for confrontation had been assembled. Never during the heightened periods of struggle did SYRIZA, in its fetishisation of Europe and the Euro as a progressive force, launch campaigns in order to further radicalise the workers to inform them of the ultimate necessity to smash the European Union – or at the very least agitate for the need to exit the Eurozone. The reformist idea that the EU is somehow progressive because it’s a supranational institution has no basis in reality. Bourgeois internationalism is not progress. The EU is not progress. It’s about as progressive as NATO, and yet to leave NATO would not be to retreat to the nation-state, as some idealists claim in support of the European Union. The fundamental reality is that Tsipras’s orientation towards the European Project is steeped in idealism and rejects the concrete analysis of the EU’s class nature. It is an institution to serve the interests of European capital in order to compete with American capital and divvy up the gains of the exploitation of the periphery. I can only hope this casts light on the absolute futility of the reformist nonsense advocated by those in their approach to Podemos in Spain and Sinn Féin in Ireland. There is no more room for a softly-softly approach, and continuing to support SYRIZA’s method after its demonstrable failure is inexcusable and unjustifiable. If SYRIZA failed, parties further to its right are going to lead the left in falling onto its own sword. SYRIZA as a vehicle for working class struggle is dead. What’s needed now, urgently, is an initiative of the anti-capitalist, revolutionary left in Greece to form a unified opposition to SYRIZA and the new austerity memorandum. To do this requires the cooperation of the non-sectarian left to mobilise workers against the government. Unfortunately, no such left exists in Greece as a major force. After the capitulation of SYRIZA, the next major party of the left is now the Communist Party(KKE). Why is SYRIZA’s left, still its left? In the aftermath of the historic defeat in parliament, in which 39 SYRIZA MPs voted against the government in rejecting the deal, the leader of Left Platform, Panagiotis Lafazanis, came out in firm support of the government and of Tsipras, stressing the need for unity moving forward. This is an untenable position – “We support the government, but reject memorandum!” – the memorandum is the government now. SYRIZA is a party now facing fundamentally irreconcilable internal contradictions, between its revolutionary formations and capitulating social-democratic ones. Such a substantial formation cannot remain within the government whilst opposing the core of all the government’s policies. Not only is this dishonest in the extreme, by providing further left cover for Tsipras, it will also only lead to failure. Rupture is the only way forward. Rupture with the party leadership and join up with the revolutionary left outside of SYRIZA, and in doing so show the KKE that there was something of worth in SYRIZA. Just as the KKE must reach out to the other formations on the left, SYRIZA’s left must make the necessary move and split to join with, or if necessary form, a left opposition to this government of the right. Finally, by leaving the EMU, Greece will not become less European, it will follow a path that differs from the one followed by the countries of the European Union core, an option which is already well advanced in countries such as Sweden and Denmark. Literally reading “Scandinavian Social Democracy” – an economic model itself in decline – does not instil me with the confidence that the Left Platform is either capable of or willing to provide a genuine alternative which will see Greece win the unavoidable confrontation. You cannot withstand siege whilst leaving your gates open, and you do not only partially commit to war. The seizing of the banks is a crucial first step, and will allow targeted investments to provide jobs and stimulate the economy, but without nationalisations of the key industries – the commanding heights of the economy – and without smashing the oligarchy and its terrorist media apparatus, introduction of rigorous capital controls, and creating a state monopoly on foreign trade, these steps alone will not produce victory. The softly-softly approach has failed. The left factions of SYRIZA must make clear their intents: Revolutionary action or capitulation. With the capitulation of SYRIZA’s leadership, the question must be put to Left Platform and other left factions in SYRIZA: “Will you split to join with the rest of the left?”. Without a positive answer to that question, Left Platform can discuss what’s needed all it wants but it shall become a servile appendage to the right wing coalition of Tsipras, New Democracy and PASOK, sewing illusions in SYRIZA as a vehicle for workers’ power and reaping the bitter fruits. All power to the KKE? The KKE have the ability to dangerously organise. They have numbers, discipline, programme and the militancy to organise a revolutionary party. Sadly, they’re crippled by their own sectarianism, the most farcical example of which was during the referendum in which the KKE advocated that people spoil their ballots. To their credit, the number of ballots spoiled during the referendum nearly reached 6%, so they have the authority to convince a lot of people to do something, even if it’s ridiculous. For there to be a real organisation of the left capable of challenging Capitalism in Greece – which is where the discourse must shift to – the KKE must reach out to other sections of the left, in ANTARSYA and various other “unaligned” left organisations, such as Xekinima. They must look to SYRIZA’s left and tell them in simple terms: “SYRIZA is over, we have a place for you if you leave”. By doing so they will rip away much of the disillusioned supporters of SYRIZA and soften the blow of defeat. Refusing to do so will inevitably work to the benefit of Nazism in Greece, with Golden Dawn feasibly capable of doubling its support in the face of the capitulation of reformism. But is this likely to happen? We can discuss the organisational merits of the KKE all day – and there are many, despite its flaws(The homophobia, I could do without) – but if they’re going to continue on the same path as before, it will be in vain. And despite some dissenting murmurs from members of the Politburo, the KKE looks set to continue on its path to self-imposed irrelevancy. While many continue to call for the left to rally around the KKE, claiming their analysis of SYRIZA vindicated, so long as they do so without demanding serious changes from KKE itself all they are asking is for the left to become mindless auxiliaries in service to a flawed leadership. Asserting that the Greek left must join with the KKE without asserting the KKE must shift away fundamentally from its sectarian stance is a fruitless task. You must have the latter before you have the former. Supporters of the KKE insist that the recent turn of events has shown their analysis to be the most accurate in the end. That the KKE’s stances have, at long last, been vindicated. With the power of hindsight one could agree that the KKE’s assessment of SYRIZA as a capitalist party in terms of its orientation was, in reality, correct. But it’s not always about the analysis, in fact the more important thing is what is done given that analysis. Whether or not SYRIZA was a capitalist party didn’t change that there are strong anti-capitalist elements within it. It didn’t change that there is a revolutionary left within it. Working with this left was and continues to be essential to fighting the capitulations of the leadership, and working with the broader revolutionary left outside of SYRIZA is an integral component to this process. Simply put, no, the KKE is not vindicated of its actions. The Greek working class, rightly or wrongly, were looking to SYRIZA for leadership. 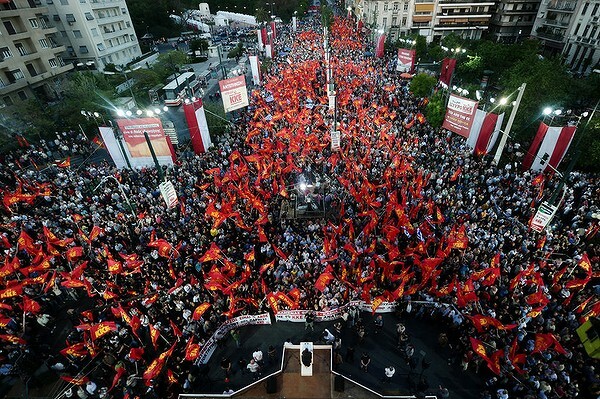 The KKE has further isolated itself from the workers by refusing to cooperate with SYRIZA’s positive elements and refusing to integrate itself into the mass mobilisations – the key one being the referendum campaign. Had the KKE used its opposition to build a substantial force to the left of SYRIZA, through joining up with the forces outside of SYRIZA and getting the left factions of SYRIZA to orientate towards that, then their position would be vindicated. One must ask the KKE what it has to show for its efforts 6 months in opposition, because all I’m seeing is a country in retreat and a left in disarray. The passive nature of their opposition has made their stance produce far worse results than if it had taken an “opportunist” turn and entered coalition with SYRIZA. When people proclaim in the face of recent events that yes, KKE was right, I can only respond with the opposite. KKE has a lot to speak in its favour. Good programme, large numbers, discipline, organisation, and even to be generous to it, its analysis of SYRIZA was broadly correct. But what it has done given this has simply been wrong, and this isn’t a phenomenon unique to the KKE of 2015, this is a long standing pattern of the KKE’s method of operation, everything comes packaged with a dose of sectarianism. All of those things that speak to the KKE’s credit mean nothing if it’s not amongst the working class, meeting them where they’re at and pushing them forward. Until then, no, we simply cannot say the KKE has been vindicated. Without a coming together of the left forces, including KKE, the left in Greece wont regroup and rally in the face of this defeat. The workers will be disillusioned with the left and our politics, and will turn to others to fight their battles. The threat of Nazism in Greece is not the be understated, it’s serious and the task of anti-Fascist forces in Greece is growing more urgent. Golden Dawn’s leaders may be locked away(Or heading there), but they can capitalise massively on the defeat of SYRIZA regardless. A mass workers’ movement based in the principles of Marxism and Communism is needed now more than ever, and the forces in Greece cannot do this divided. The defeat of reformism and left-Europeanism is there for all to bear witness. The strategy of SYRIZA is no more. This should send a message to the left forces across Europe – Spain and Ireland in particular – that this is not a matter of simply putting better negotiators in power. Getting a better deal from the Troika is not possible because the Troika is not interested in a deal. SYRIZA’s failure was in the assumption that the negotiations were genuine, they were a ruse. This is going to hit the reformist forces of Sinn Féin and Podemos hard, given their close ties to SYRIZA and their strong support for SYRIZA’s method of operation, and in no small way with the mass media’s association of these parties with SYRIZA. Those who looked to these reformist parties to right the wrongs will be rightly disillusioned, doubly so given that Sinn Féin and Podemos have only shifted themselves to the right as opposed to positioning further to SYRIZA’s left. The post-Marxist attitudes prevailing in Podemos are going to be its undoing(See: Between Ideology and Public Discourse), and Sinn Féin’s populist nationalism will provide no answers to the problems facing Ireland. Mass workers’ parties independent of right wing forces, based firmly on revolutionary class politics, are what is needed now, urgently. This is the only politics that realises that to break from austerity, the road of confrontation must be taken, and on no other basis will victory be achieved. Concretely in Spain, it’s imperative that Izquierda Unida(United Left) not attach itself inseparably to Podemos, which has consistently drifted further to the right and has lost itself to populist politics. IU’s weakness is clear, Podemos has undermined a lot of its support during its development and it appears that regardless of what IU does, its support base is not expanding. Its response has been to operate joint “Popular Unity” lists with Podemos where possible, and has offered to do so for the general elections – which the Podemos leader, Pablo Iglesias, has so far rejected. In Ireland, the developing workers’ parties of the Anti-Austerity Alliance and People Before Profit Alliance must not let themselves orientate towards Sinn Féin, or support a Sinn Féin government – a government of religious sectarianism and soft austerity, in other words a government of division and capitulation – and must work together to build the forces of the left and not cave into to pressure to coalition or cooperate with Sinn Féin. To do so would betray the confidence of anti-sectarian workers in Northern Ireland and sew illusions in Sinn Féin as a legitimate force on the left, which it is not. Only through militant, mass politics do we stand a chance of winning in this period. No other choice is possible. Social Democracy is dead, let Socialism live. Sami is a Marxist, and a member of the Socialist Party of Ireland, Irish section of the Committee For A Workers' International. This entry was posted in Bourgeois politics, Critique of the Left, Politics, Proletarian politics. Bookmark the permalink. 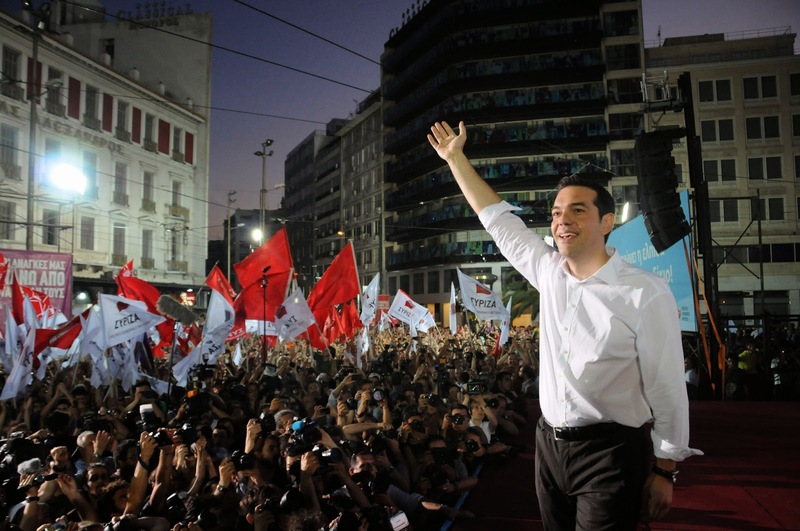 One Response to SYRIZA: Was capitulation inevitable? The February 20th statement was not an agreement to Troika diktats — if that were the case, there wouldn’t have been any negotiations subsequent to that date and clearly that’s not what happened in the months since. You don’t negotiate diktats. 1. It takes more than “months” to get a new currency ready; maybe a year or more. 2. SYRIZA was not elected on a Grexit mandate. Over 80% of Greeks said they favored the Euro a week after the OXI referendum. Do you think a democratic party can successfully defy the will of 80% of the people and stay in office? To understand why no major social-political force outside of Golden Dawn supports Grexit, you have to understand what such a move entails: 50% devaluation, possibly even famine. See: https://pplswar.wordpress.com/2015/07/16/is-tsipras-a-traitor-for-refusing-the-drachma-of-grexit/ Rejecting the possibility of a famine and the risk of turning Greece into a failed state don’t make Tsipras a coward at all. There was a strategy for confrontation and the confrontations took place at the negotiating table. There were six months of endless confrontational negotiations. The author doesn’t seem to notice the contradiction between this paragraph and the one re: February 20th, that is, between claiming SYRIZA surrendered to Troika diktats on February 20th and noting concessions made by negotiating teams. They either surrendered in February or they didn’t; can’t have it both ways — they couldn’t have surrendered and then continued negotiating after giving up the fight. That makes no sense. This is idealism of the first water: Ideas determine being. SYRIZA’s ideas determined their defeat. Do unions need to be led by revolutionaries or Marxists to successfully negotiate with employers and to extract concessions from them? Of course not. The same applies here. What’s missing from this analysis is any assessment of the balance of power within the Eurozone — 1 left government of a broke, semi-starving frankly economically insignificant country against 18 center and right governments, among them the most powerful nations of Europe! Do you really think if you put Karl Marx in as PM instead of Tsipras and Trotsky in the place of Varoufakis the outcome of these confrontational negotiations would be any different in material terms? This is frankly bizarre. Bourgeois internationalism is progress and progressive compared to bourgeois nationalism and bourgeois chauvinism. What the author appears to be championing here is right-wing Euro-skepticism but with left-wing gloss. We are internationalists — we support greater international cooperation and economic, political, and social integration, even when it is bourgeois cooperation and bourgeois integration because that bourgeois cooperation and integration — despite what the bourgeoisie intends — brings their respective working classes into closer association and cooperation also. Look at how close the growing ties of Podemos, SYRIZA, and Die Linke, for example. We now have a pan-European left in a way that didn’t exist 50 years ago. The EU is bourgeois-dominated because it is a conglomeration of bourgeois-dominated governments just as the British government is a bourgeois-dominated government because the party of the big bourgeoisie, the Conservatives, controls it. What would happen if SYRIZA and its equivalents came to power all across the EU? Then the EU would have a different class and political character, no? And if not, why not? No more room for reforms, revolution for #FullCommunism and nothing else! Sorry comrades, but impossiblism proved its political bankruptcy ages ago during the days of DeLeon and Bordiga.